Interested in more facts and figures about Luxembourg. Well you can look at some data published by our statistical office, the STATEC. Boring? 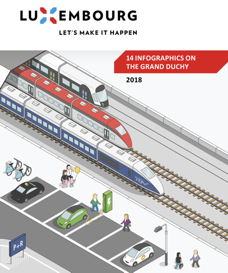 Well than you might prefer the nice infographics you can find at the official portal of the Grand-Duchy of Luxembourg. They are very fun to look at. All the people who were in Luxembourg in 2015 got the edition of that year. The 2019 edition is not yet released, but should come out soon. On this portal you will find more interesting facts about Luxembourg, which is worth a visit! Don’t forget to tell us when you want to come, so that we can welcome you!